This is a vintage layout that I created and plan to frame as a piece of wall art. Vintage art pieces are very appealing to me. I’m not sure what it is about vintage themes that I love so much, but creating vintage pieces make me excited to try new things. I love the idea of taking aged elements and combining them with modern elements to create that juxtaposition of something new and interesting. There are so many gorgeous products on the market to create this type of art. Prima has some lovely products that just seem to call my name. The paper that I used in the “Adore” layout is from Bo Bunny (Isabella). I absolutely love it!! If you get a chance, go to an online store and check out that product line. 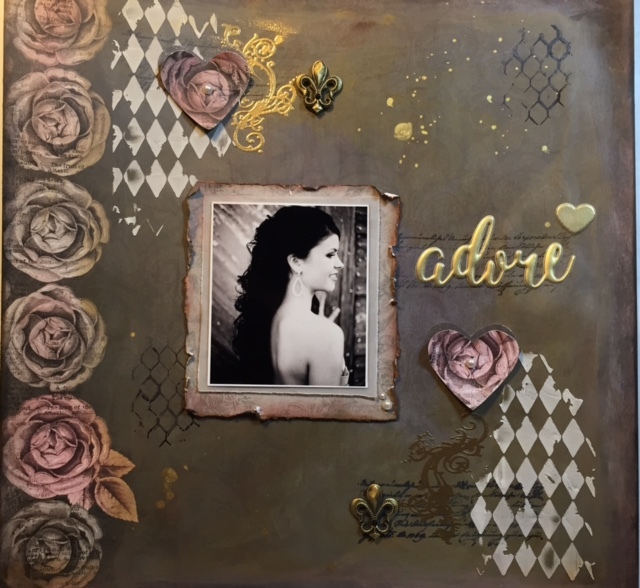 Creating a vintage look with mixed media is not that difficult. It just involves some time and some layers. Adding gesso and gel medium to the products provide a good base to add your layers on to. Then it’s just a matter of deciding what you want to add for media. I love all things Tim Holtz and Ranger. There are so many great inks, pastes, markers, mists, paints, etc., etc. In the “Adore” layout I use: Tim Holtz stamps, Distress Inks, Distress Paints, Tim Holtz Stencil (Harlequin), Pearl stickers (Stampin’ Up! ), Jolee’s Boutique stickers (Fleur de Lis), Bo Bunny stamp, Faber Castel gesso, Gelato (pink), matte gel medium, Archival Black Ink, American Crafts white card stock, Gold Color Shine, Vellum, Stampin’ Up! gold embossing powder, Versamark ink, foam tape adhesive. I had so much fun creating this layout!! The video link below is a tutorial that explains each step to create this piece. I love how it turned out and I am going to frame this one for the wall. I love the vintage look of the Adore layout. It’s so soft and feminine and suits the photo you chose perfectly.